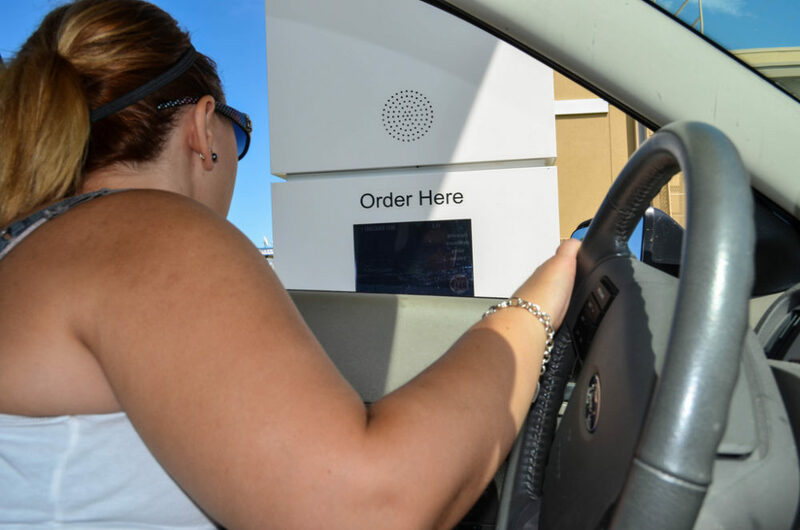 All I’ve gotta say is… Wow, fast food drive-thru’s are seriously fast these days! I don’t go to the drive-thru much. Fast grease food restaurants just aren’t really my thing anymore. Also reminds me of a Bud Light Real Men of Genius ad — because I can never decide on what to order at a fast-food restaurant. It’s all pretty much the same to me. However, Jim was out of town this past week, and I found myself craving the convenience of fast food restaurants for a change. I opted for Wendy’s and McDonald’s on 2 different days — for a salad. While fast food salads aren’t usually much to speak of, I was pleasantly surprised with the quick service I received both times at the drive-thru window. It’s as if they’re actually purposely trying to get cars in and out quickly — at least during the lunch hour. 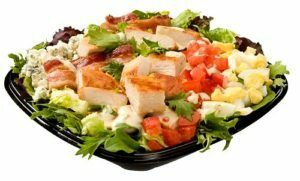 Must read: Are Fast Food Salads Healthy? For the record, the McDonald’s salad (Crispy Chicken Bacon Ranch) blew the Wendy’s salad (Chicken BLT Cobb) away! In pictures, the Wendy’s salad looks better than the McDonald’s salad. But in my mouth, the McDonald’s salad was better. However… Maybe I should’ve opted for the cheeseburger instead of the salad after all. Here’s why. Here are the current menus featuring McDonald’s salads and Wendy’s salads. Is Eating A McDonald’s Salad Unhealthy? Perhaps I should just resort to eating dog food the next time I’m craving fast food salads. Word is, dog food might actually be better for you than fast food anyway! After enjoying the Bacon Ranch McDonald’s salad for several days in a row now, I’d have to say that I’m officially addicted! However, I’ve managed to try this salad from 3 different McDonald’s locations where I live — and what a difference. Franklin, TN (New HWY 96) – EXCELLENT salad. Chicken was very crispy on the outside and tender and hot on the inside. FRESH salad leaves, with primarily a mixture of spring greens rather than iceberg lettuce. LOTS of bacon and cheese (what gives this salad its name). Nashville, TN (Broadway downtown) – The “crispy chicken” I ordered turned out to be “grilled” — which was a huge disappointment after leaving the drive-thru. Chicken was fatty and slightly undercooked with strange seasonings. There was hardly any bacon & cheese — which made this just like any salad with spring greens. So, I’m sticking with the best. Fortunately the McDonald’s that serves the best salads is also the one closest to my home. I’m glad I had the best first — otherwise, I’m fairly certain that I never would gotten a second Bacon Ranch salad from McDonald’s… ever! My latest addiction is the McDonald’s Fruit & Walnut Salad! It’s filling enough for a meal itself, but I often get it as a “healthy” dessert or snack (…at a cost of 310 calories). And, yes, I do realize those sugar-coated “candied walnuts” are far from healthy! Here’s some interesting dialogue about McDonald’s salads.